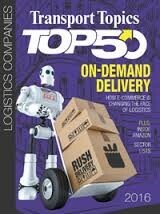 Supply chain solutions provider, Kane Is Able (KANE), has been named as a Top 50 Warehousing Firm and a Top 50 Dedicated Contract Carrier of 2016 in Transport Topics magazine. Kane Is Able was named as a Top 50 Warehousing Firm of 2016 in Transport Topics magazine. KANE’s national distribution network has been experiencing tremendous growth across North America, now reaching over 8 million square feet in all major markets. With 25 distribution centers, KANE’s mission of dependable people, exceptional logistics drives our business to exceed our customers’ expectations. Kane Is Able was also named in the Top Dedicated Contract Carriers category, providing dry, refrigerated, and specialized dedicated contract carriage services to manufacturers and partners from a variety of industries including food, beverage, retail, wine and spirits. In an outsourced services environment, culture matters. KANE’s approach to customer service is embodied in the KANE Code, our operating philosophy on delighting our customers. Kane Is Able helps manufacturers and their retail partners efficiently and effectively distribute goods throughout the United States. KANE’s value-added logistics services include retail consolidation, contract packaging, fulfillment, and logistics workforce management.